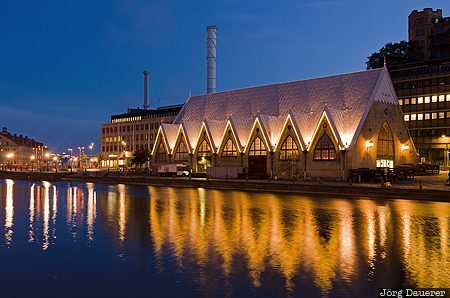 The flood-lit Feskekôrka ("Fish Church") Building in Gothenburg at the blue hour before sunrise and its reflexions in Vallgraven. There is a fish market and a fish- and seafood restaurant inside Feskekôrka. Gothenburg is in Västra Götaland, Sweden. This photo was taken in the morning of a rainy day in September of 2014. This photo was taken with a digital camera.